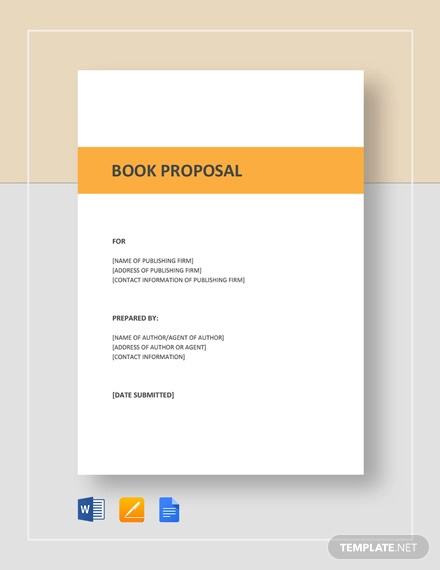 A book proposal is a simple proposal format that is used to sell nonfiction books to publishers. It shows why your book is a saleable and marketable product. The book proposal act as a business plan that convinced the publisher to make an investment in your book. In a novel, the entire book is written first, then trying to find an editor or publisher. In the case of a nonfiction book, the book proposal in written first before you write the whole book. If your book proposal template convinces the publisher, then they will contract and pay you to write the book. Create a rationale. In the first two paragraphs, give a concrete reason why your book should be published, why is it important, your approach and methodology in writing the book, and include who will be your audience. Research the publisher. Once you find your publisher, research them and find out what book they have already published and show excitement in working with them. Write a description of your book. Describe your book. What is its theme, concept, and the way you develop the narrative of your book. Table of contents. Make a sort of a table of contents of the chapters and describe each chapter. State your sources. Write all the sources you used to gather your research and provide a summary of the materials you used. Determine who will read your book. Mention who will benefit in reading your book and how they can benefit from it. Compare your book to other published books. State why your book differs from other books that are published by that publisher. Give the specification. State the length of your book and the word count. Schedule your book. Give a date when you book is ready for a scholarly review. Provide an author biography. In 1–2 paragraph, tell them how qualified you are in writing that book. Here are the tips in writing a book proposal that the publisher would actually read. Write a letter first. Craft an offer letter that will get the publisher to read your book proposal. Get the publisher’s attention in the first paragraph. It is important that on the first paragraph, the book proposal would automatically capture the attention of the publisher. By then, they will have an interest in your book and will actually continue reading it. Determine your audience. Your audience is the most important aspect of your book proposal. It sets out a clear understanding of will actually read your book if it is published. If the readership of your book is uncertain, why would the publisher publish it? The book proposal should describe your book detailed-by-detailed. All the information necessary to describe your book as a whole must be written in the book proposal. That way, the publisher himself know what your book is all about and most likely to publish your book. Follow a correct book proposal format. The key to an effective proposal is that it follows a structured free proposal example. The book proposal is not an exception. With the proper format, your book proposal will be easier to read.